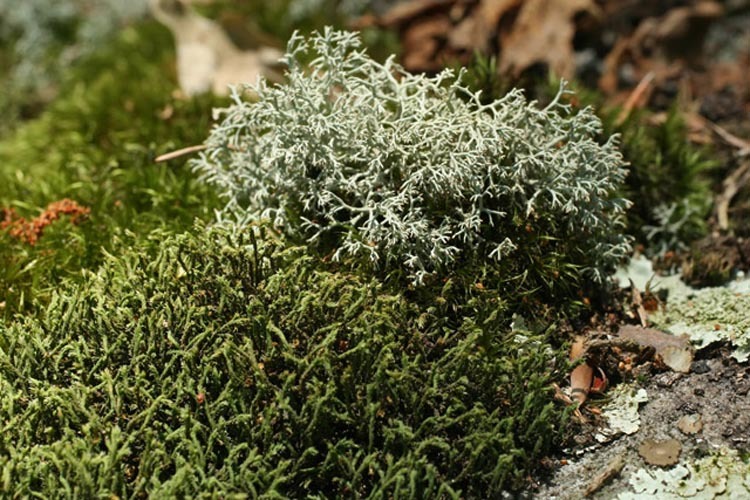 In partnership with the West Virginia Native Plant Society, the Ohio Moss and Lichen Association (OMLA) visited an area of the Wayne National Forest in Gallia County that is especially rich in lichens and mosses. This area is under consideration for designation as a protected lichen and moss study area. 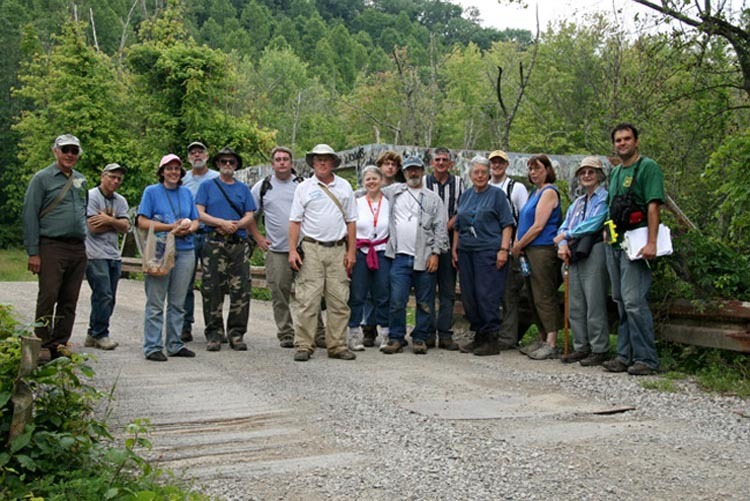 OMLA and West Virginia Native Plant Society at Symmes Creek, Gallia Counbty, Ohio. June 21, 2008. 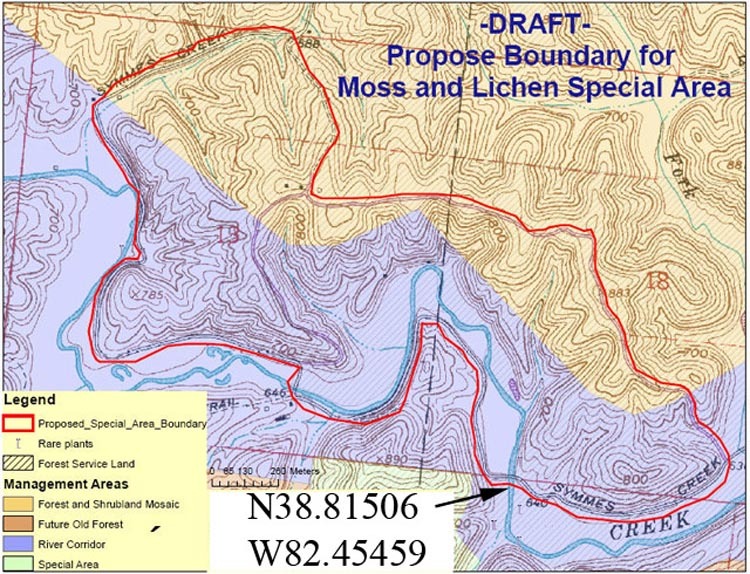 Proposed Moss and Lichen Special Area in Wayne National Forest, Symmes Creek, Gallia County, Ohio. The arrow and geographic coordinates show where we parked and walked in along the Creek. We scaled some bluffs in the woods. 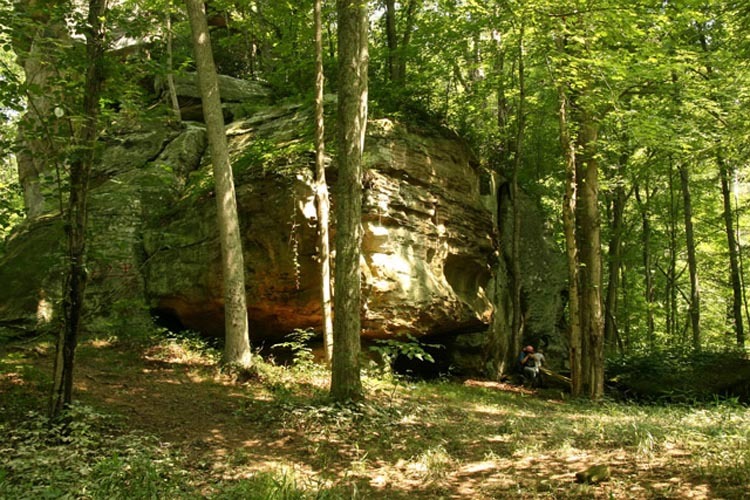 There is some steep relief, a sandstone bluff, where mosses and lichens are abundant. Sandstone rock outcrop near Symmes Creek, Gallia County, Ohio, June 21, 2008. Diphyscium foliosum at Symmes Creek proposed moss and lichen special area. Gallia County, June 21, 2008. 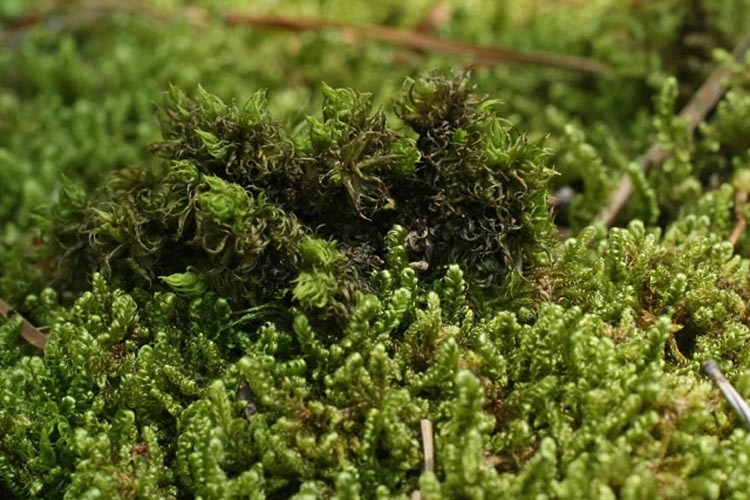 Although this is one of our most distinctive mosses when it is “in fruit” (the useful but very inaccurate term for a moss that is bearing sporophytes), sterile Diphyscium can be tricky to ID. The strap-shaped leaves, sometimes growing quite densely, can mislead you into thinking it’s in the family Pottiaceae. The leaves are distinctly dark, almost blackish, when dry. The woodsy, often acidic, habitat is a good clue. 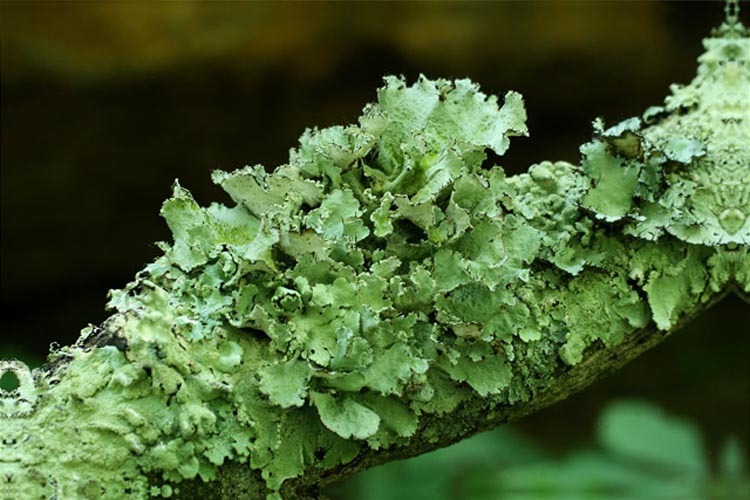 Growing on the bark of a small slanted dead wood sapling is a lichen Parmotrema hypotropum, the powdered ruffle lichen. 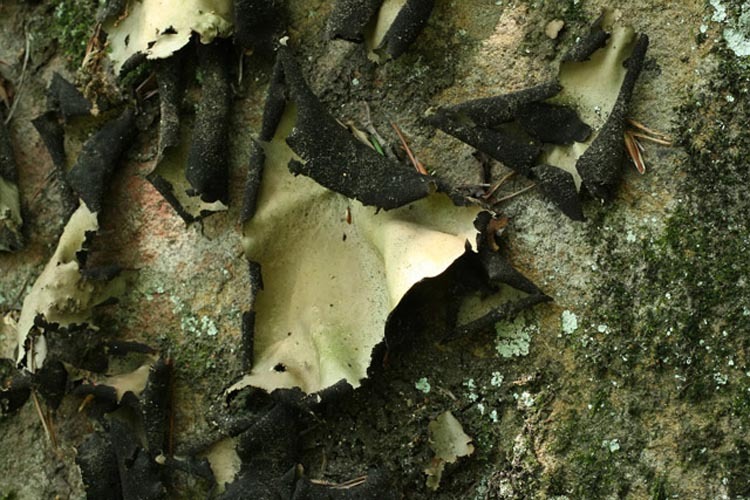 Another distinctive lichen is a “rock tripe,” Umbilicaria mammulata. The rock tripe lichens are large leathery wrinkled discs attached to the tops and sides of rock outcrops and boulders. Symmes Creek area, Gallia County, Ohio, June 21, 2008. Growing on top of this huge rock tripe-adorned boulder are several mosses and a reindeer lichen. 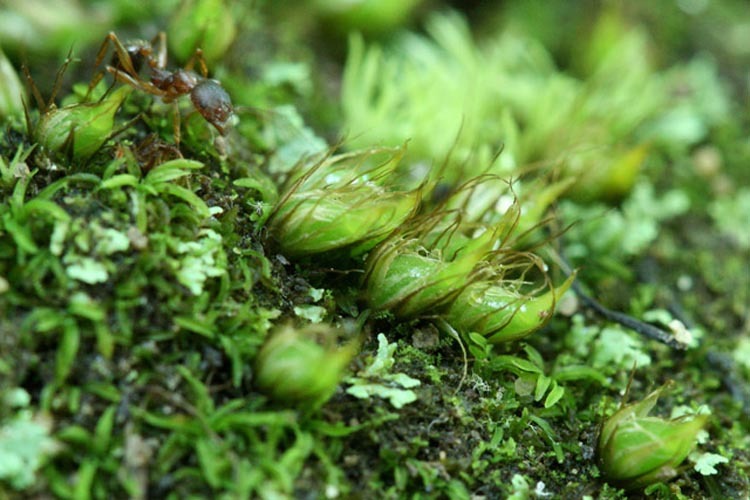 One of the most abundant mosses here is strictly a dry rock-top species, commonly found on granitic or sandstone-based rocks, but not often calcareous ones, Hedwigia ciliata. Hedwigia displays a growth form very similar to the fruticose (shrubby) lichen, Cladina subtenuis against which it is snuggled. This Cladina is an example of a “reindeer ‘moss’,” related to arctic forms that are indeed staples of reindeer and caribou. Hedwigia ciliata moss and Cladonia subtenuis (reindeer ‘moss’) atop boulder. Dicranum spurium and Hypnum imponens atop sandstone boulder. Gallia County, Ohio. June 21, 2008. 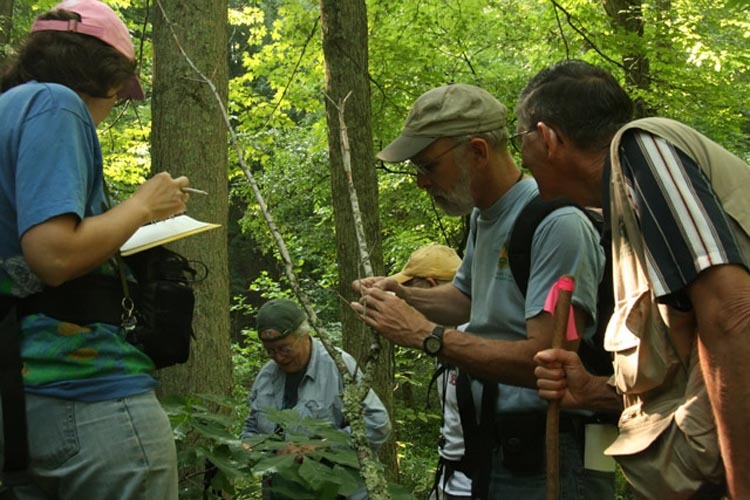 OMLA members examining corticolous cryptogams at the Spring foray in Gallia County, June 21, 2008. Because this was a one-day foray, we didn’t have an evening lab ID session. Members took specimens home for identification. So far, we have the following mosses confirmed: Steerecleus serrulatus, Hypnum imponens, Haplocladium microphyllum, Bryoandersonia illecebra, Mnium affine var. cilare, Pylaisia intricata, Anomodon attentuatus, Dicranum scoparium, and Atrichium undulatum (in the broad sense, as several forms of Atrichum previously considered varieties of A. undulatum are now recognized as species). If you were on the foray, please submit your identifications for a more complete list in the next issue of OBELISK.